The CBC Literary Prize winner and author of We're All in This Together on Finnish pancakes and other delicious moments in writing her first novel. 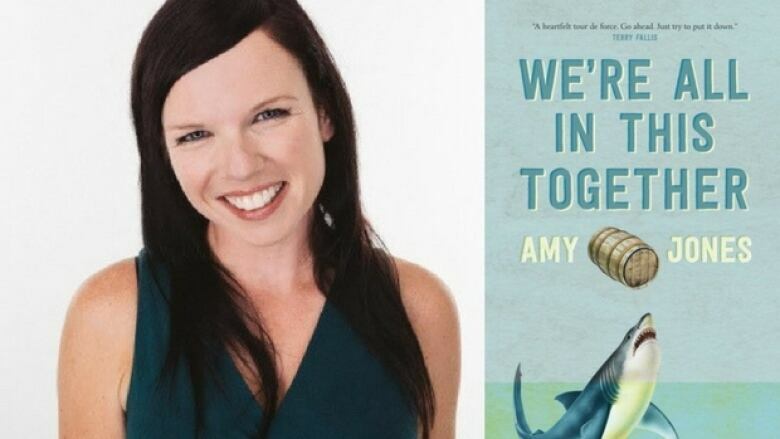 Amy Jones' novel We're All in This Together begins with 63-year-old Thunder Bay grandmother Kate Parker going over a waterfall in a barrel. She survives the fall (and a cellphone video of the feat goes viral), but slips into a coma a short while later. Her large, eclectic family is thrown out of its comfort zone, with a wide range of colourful characters taking the wheel of the narrative. It's the first novel from Jones, who won the CBC Short Story Prize in 2006. In her own words, she explains how she wrote We're All in This Together. "You sort of go into it as a short story writer, or at least I did, thinking a novel is just a longer short story. But really it's a whole other thing. I'm used to working with a real economy of language. And so something that would take one line in a short story started expanding into paragraphs and then scenes. I have a tendency to want to say things in as few words as possible, but that doesn't always work with a novel. So I'm learning to expand my language. I liked having the freedom and the space to go more into the characters' heads and more into the story." "One of the major themes in the book is that even within a family, we all remember things differently and we all have different perspectives on each other and on things that happened in our histories. I liked having everyone else's perspectives on [family matriarch Kate Parker] for the first half of the book, and then having her come in and flip things on their heads a bit. It was really important for her to have her own voice and not just have people talk about her for the whole book. "When I went through the revision process after putting the whole thing together, I ended up working on each individual character's story arc individually, so that I could maintain a consistent voice. It was definitely about getting into a different head space for each character. I'm a very visual person, so I had Bristol board all over my house and different-coloured Sharpies for each character. By the time I put it together, it was really interesting to see how there was all these different voices but they were coming together under the same themes, and the main story arc still stuck together." "I knew from the beginning that I wanted to have Finnish pancakes in there. I don't know if the rest of the world feels this way, but to me living in Thunder Bay, it's such a cliché. People come here and that's the one thing they know about Thunder Bay. They know about the Hoito [a Finnish-Canadian restaurant in Thunder Bay] and they know about Finnish pancakes. So I thought that I had to write the pancakes into the book, a little bit tongue in cheek, but at the same time it does represent a huge part of Thunder Bay culture. Everyone here has their own opinions about where the best pancakes are!" "I hope that it's both. I feel like it's really two sides of the same coin. I wanted the reader to have some fun while they were reading it, but at the same time, it's real life. And real life can be funny at the same time that it's sad. This is a book about a family going through this really emotional time, but I mean, even in the most emotional times that I've had in my life, there's always things that make you laugh. And you have to find the humour and absurdity in it or you kind of go crazy. "That was what I was going for — even in the funniest moments there can be darkness, and even in the most heartbreaking moments there can be humour. I do get a lot of feedback where people say it was really funny, and I'm glad, I wanted it to be funny, but I also hope that within that people can find the moments of honesty and vulnerability as well." Amy Jones' comments have been edited and condensed.